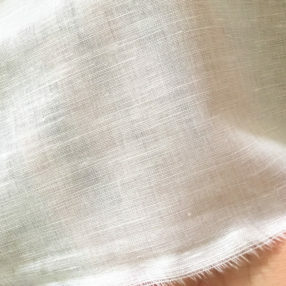 Our new handkerchief linen/cotton blend is great alternative to more expensive 100% linen. It has a nice, soft hand (with less wrinkles) that you will love from the first time you feel it. It is 53″ wide and lightweight so that you can gather, pleat, or smock without adding bulk. And it only weighs 3.0 oz per square yard! Ask for a swatch and you will see/feel the quality.